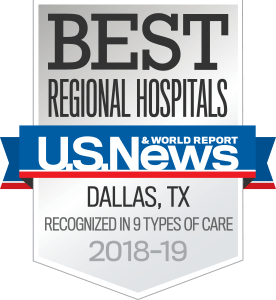 UT Southwestern’s Inpatient Rehabilitation Unit is a 36-bed unit, located on the sixth and eighth floors of Zale Lipshy University Hospital. We are a state-of-the-art facility providing leading-edge rehabilitation therapies and techniques. The Unit provides 24 hours a day rehabilitation nursing care to patients, ages 18 years or older. Exceptions for patients younger than 18 years old will be made on a case-by-case basis. Therapy services are available seven days a week. Social work services are available Monday through Friday. Care coordination services are available Monday through Friday. Psychology services are available Monday through Friday. Patients admitted to this unit must have a medical or surgical illness, injury, or an acute exacerbation of a chronic illness that limits their mobility, self-care, communication, swallowing, cognition, recreational/leisure activity, and other functional abilities. Intensive rehabilitation reflects each individual patient's needs. Intensive therapies consists of at least 3 hours per day at least 5 days per week, or an average of at least 15 hours per week. Patients must demonstrate behaviors of ability, desire, and motivation to participate in the intensive therapy program, and have the potential to make significant functional improvement. Rehabilitation will be focused on the individual needs of the patient, including activity limitation, behavioral status, cultural needs, participation restrictions/precautions, and their psychological status. The intended discharge or transition environments will be identified prior to admission and throughout the rehabilitation stay. In addition, admission will be considered for patients and families who need rehabilitation services for family training and preparation for returning the patient to their home environment. For Inpatient Rehabilitation referrals for admission, or to schedule a tour, please call 214-645-4833.